No major system coming our way next week. The Eastern UAC fizzles out and forms and elongated trough east -west. The Western end of the trough develops a circulation and creates a UAC over MP/Rajasthan border on Monday. On Monday, Rains likely for a day over the region. heavy rains in Udaipur, Kota, Ujjain and Bhopal regions. 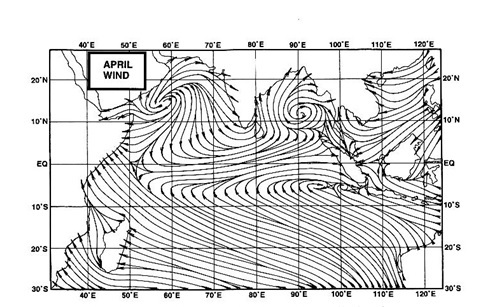 Weak anti cyclone clockwise winds aloft during the week over North Pakistan and adjoining NW India. I do not want to jump to any conclusion (on withdrawal) now as the clock wise winds are weak and could change direction soon. Almost no rains expected in Pakistan. 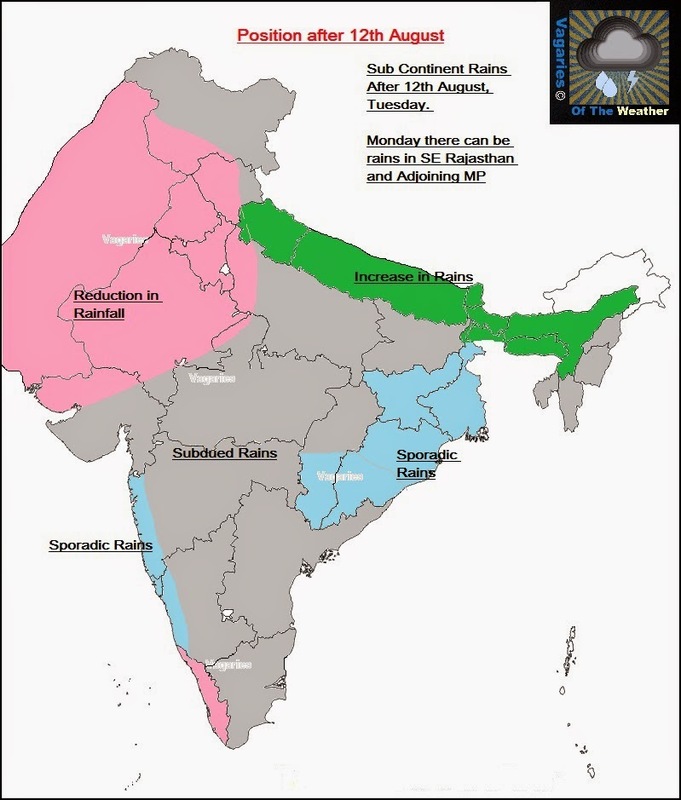 Also in India, Rajasthan, Punjab, Haryana Delhi and North MP and West UP see decreased rains. Almost no meaningful rains in the Peninsula South of Gujarat/Maharashtra. The West coast regions of Maharashtra and Karnataka also get less rains, though could average around 20-30 mms in places. Major reduction in Kerala next week. Rains increase in Nepal and Uttarakhand from Tuesday as the axis moves into the Himalayas. Heavy rains expected in Kathmandu middle of next week. Increasing precipitation in Sikkim, Bhutan , North Bengal and NE States. Mumbai: Passing showers in the next few days. Frequency and intensity decreases from Tuesday. Daily around 15-20 mms. Delhi NCR: Rainfall in parts on Monday. Decrease after Tuesday.Rise in day temperatures. Surat: After getting Showers on Monday, rainfall decreases after Tuesday. Kolkata : Heavy showers on Tuesday and Wednesday. Cloudy and overcast conditons next week. Though we have a weak Easterly pulse in the Southern Bay later this week, we would have to wait and see the intensity to gauge the rainfall in Chennai on Thursday or Friday. No meaningful rains in Karachi and Sindh. Just about some light rains end of week in Pak Punjab and Islamabad. Delhi NCR received its weekend ( Sunday) showers, and adjoining areas got showers.Many Vagarians reporting rain from Delhi and Meerut. Etawah in West UP got 5 cms and Mathura 2 cms. Naraingarh (Haryana) also got 5 cms. In Punjab, by Sunday morning, Gurdaspur, Madhopur and Jalandhar got 5 cms. Kasauli ( HP) managed 11 cms. In Goa Sanguem got 7 cms, Margao and Mapusa got 5 cms anf Panjim got 42 mms till Sunday morning and mms in the day on Sunday (till 5.30 pm). By Sunday Morning, Mumbai City got 19 mms at Colaba and 29 mms at Scruz...Matheran recorded 22 mms. We had mentioned 2 UACs in our previous post. UAC over W.Bengal and the UAC over Kutch are fizzling out by Sunday night as expected. Now what next week....Coming up tonite. Today is the last day for putting your entries for Vagaries August Contest - Link for posting your entries. 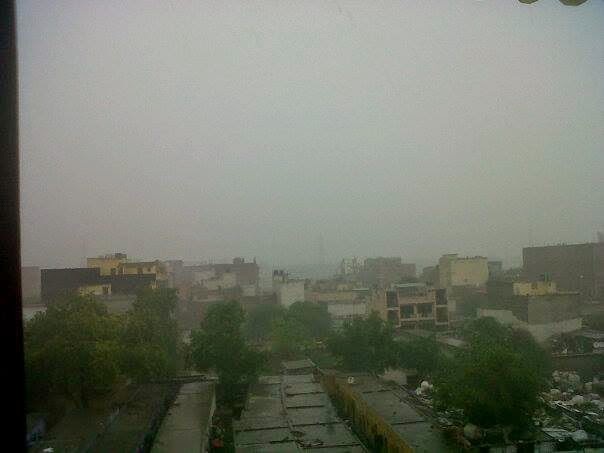 Delhi S'Jung recorded 77mm rainfall till 5.30pm. Actually 77mm fallen till 2.30pm only after that no rain. As due to festive weekend many of us were busy with family & relatives , so we have extended our Vagaries Monsoon contest August 2014 entries by 1 day. So now last date for putting entries is 11 Aug 2014 till 11.59pm IST. Please all participate in the contest now..
Rajeshbhai, Goa saw heavy rains over the weekend as predicted by you!